Michael Litos is the RTC correspondent for the CAA. You can also find his musings online at caahoops.com or on Twitter @caahoops. From GSU To JMU: Georgia State is being lauded for its ninth straight win, a school record. But the Panthers aren’t alone in their high quality play. VCU has won six in a row and seven of its last eight. The Rams’ six victories have all been by double digits, which is the first time they have accomplished that feat since 1973-74. Drexel has captured its last four games, George Mason has claimed six of its last eight contests, and James Madison has won five of its last six, including three in a row on the road. From CAA To NBA: Since it was a light week for the current CAA players and the NBA season beginning stole headlines, this is a good time to spotlight recent grads. The CAA is well-represented with five players on NBA roster. Former CAA players include Northeastern’s J.J. Barea (Minnesota Timberwolves), Hofstra’s Charles Jenkins (Golden State Warriors), VCU’s Eric Maynor (Oklahoma City Thunder), Towson’s Gary Neal (San Antonio Spurs) and VCU’s Larry Sanders (Milwaukee Bucks). 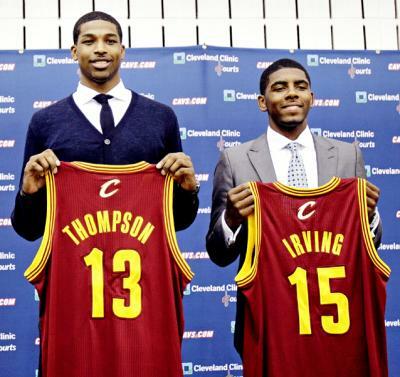 The Association has had a player drafted into the Association the past three years (Maynor, Sanders, and Jenkins). From HS SR To NCAA FR: Freshmen are seeing significant playing time around the CAA this season. All 12 teams have at least one freshman who is averaging better than 16 minutes per game and JMU is the only team that hasn’t had a freshman start at least one game. Four freshmen are among the CAA’s top 30 in scoring: UNCWs Adam Smith, Drexel’s Damion Lee, William & Mary’s Marcus Thornton, and ODUs Dimitri Batten. Four are among the top 15 in assists: Towson’s Kris Walden, Mason’s Corey Edwards, Delaware’s Khalid Lewis, and Drexel’s Lee. Three are in the top 10 in steals: VCU’s Briante Weber, Northeastern’s Quincy Ford, and Mason’s Edwards. Three are also three in the top 20 in rebounding: UNCW’s Cedrick Williams and Northeastern teammates Ford and Reggie Spencer. Overview: One of the most explosive scorers in the country who can score from virtually anywhere on the floor, Charles Jenkins has been the face of the Hofstra basketball program for the past few seasons. In fact, the Pride retired Jenkins’ jersey before his senior season was even over. His electric quickness, strong first step, and pure jump shot make him such a potent scoring threat—it is no wonder he is Hofstra’s all-time leading scoring with 2,513 points. His shot from distance has drastically improved since his sophomore year when he shot a paltry 31% to 42% as a senior. One would think that Jenkins would have a rather slim frame for being such a quick guard, but he is built like a Mack truck checking in at 220 solid pounds. Suffice it to say, Jenkins does not shy away from contact and is able to finish in traffic with the best of them. His ability to distribute the ball should not be overlooked either, as he averaged just shy of five dimes a game and boasted a 2.16 assist to turnover ratio. Jenkins is the prototypical “instant offense” kind of player that simply knows how to put the ball in the hole. Will Translate to the NBA: Jenkins will be asked to be a scorer, plain and simple. While not a terrible defender, he is certainly no Bruce Bowen that will lock down the opposition’s top guy. The knock on Jenkins has often been his size and whether he will play the point guard or two guard position in the League; both questions we believe are non-factors. First off, there is no such thing as an “undersized” player in the NBA. If you can play, you can play. Allen Iverson never had any trouble playing off the ball, and he was a very generous 6’0. There will always be room for scorers in the NBA, and Jenkins is as good as they come in this department. With that being said, Jenkins would contribute more as a shooting guard thanks to his superior shooting ability. As we near the weekend, more of the higher profile Other 26 conferences are beginning their postseason tournaments. In the east, the CAA, MAAC, and Southern Conference all get going with matinee affairs between Georgia State and UNC-Wilmington in the CAA and UNC-Greensboro and Davidson in the SoCon. 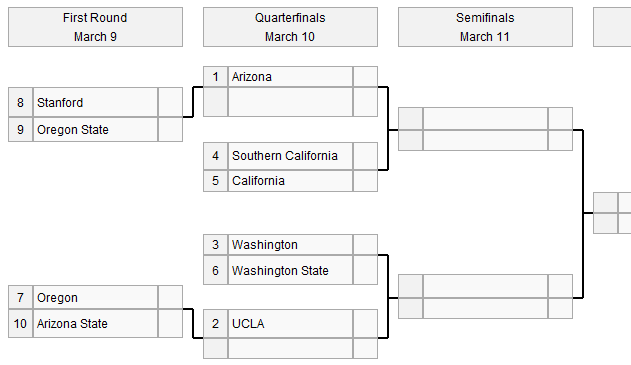 Out west, the West Coast Conference kicks off their first round in what looks to be a very competitive tournament with St. Mary’s recent struggles and the resurgence of Gonzaga. The Favorite: Behind Cam Long and Ryan Pearson, George Mason has dominated the CAA and is the clear favorite to win the league. Old Dominion will be a tough challenger for the Patriots though. Dark Horse: There have been many instances throughout the year that Virginia Commonwealth looks to be just as good as George Mason, but ending the year losing four straight games in the CAA will not instill confidence in many people. The Rams’ ability and talent is clearly there, and if they can string some wins together they can win the CAA championship. Who’s Hot: George Mason winning 14 straight CAA games makes them easily the hottest CAA team. 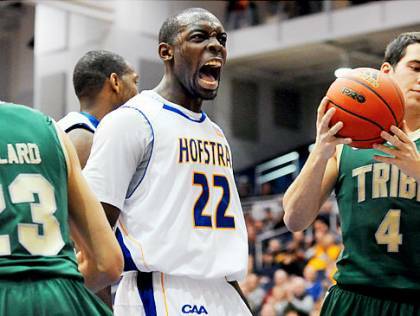 Player to Watch: One of the most decorated players in Hofstra basketball history, Charles Jenkins is the best player to don a CAA uniform this year. The senior from Queens, NY is averaging 23.2 points per game. First-Round Upset: William & Mary over James Madison. After having a very successful 2009-10 season, the Tribe has largely struggled this year, but is entering the CAA tournament having win two of three games. They have also split the season series with JMU this season winning the last game 73-67 and losing the first one 84-79. How’d They Fare? Old Dominion, as a #11 seed, defeated Notre Dame 51-50 and then fell to Baylor in the second round. 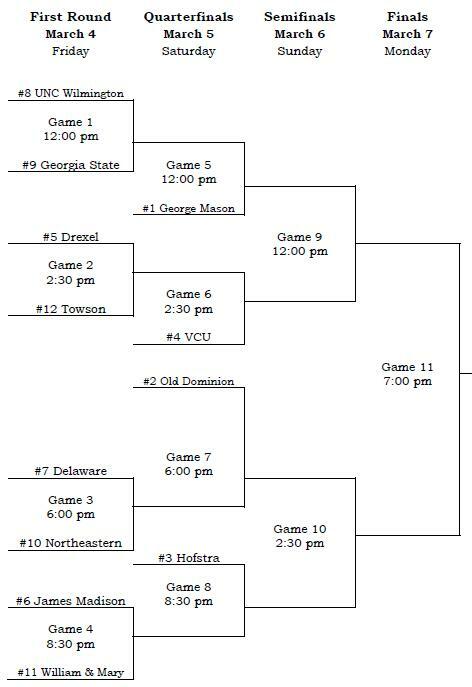 Interesting Fact: The last time the CAA sent two teams to the NCAA Tournament was in 2007 when Virginia Commonwealth and Old Dominion went; it appears as if the CAA will be a multi-bid conference this year. Nick Cammarota is the RTC correspondent for the Colonial Athletic Association. With the CAA Tournament tipping on Friday, get up to speed on the conference and gain a leg up on your Big Dance Cinderella candidate research. First-Round Game to Watch: No. 8 UNC-Wilmington vs. No. 9 Georgia State. It’s not the sexiest matchup out there, but then again, what first-round game is? The teams split the season series and always seem to play one another close. This one should be pretty interesting, too, in that whichever team wins will have to turn around and face the team with the longest winning streak in the nation: George Mason. First-Round Player To Watch: Northeastern’s Chaisson Allen. One of the more underrated guards in the conference, Allen has a strong build doesn’t seem to break under pressure. There will be no greater pressure than this weekend, so look for Allen to have a decent showing. Team Most Likely to Pull an Upset: William & Mary. 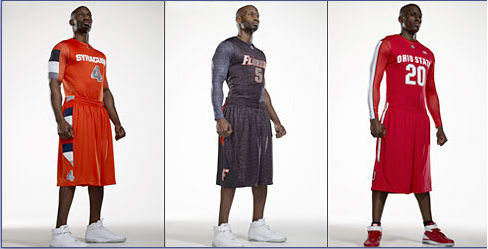 If only because they beat their first-round opponent, James Madison, during the regular season. That and junior Quinn McDowell is a threat from anywhere on the floor. Team Most Likely to be Upset: Virginia Commonwealth. The Rams are really struggling coming into the CAA Tournament and unlike years past, they don’t seem to have the right demeanor about them to turn it around and make a run. Then again, that’s what this time of year is all about. Team Most Likely to Win it All: George Mason. The Patriots have thoroughly dominated the league in the second half of the season and are playing their best basketball of the year at the perfect time. Look for this to be a two-bid conference, with both George Mason and Old Dominion capable of making some noise in the Big Dance. It has been a banner year for the CAA on many levels, and still (barring some upsets in the conference tournament) it looks as though the league will be sending only two teams to the NCAA tournament. That said, the CAA can boast that it’s one of two leagues, along with the Big East, to have six 20-game winners. It also finished with one team ranked in the Top 25 (George Mason), has the nation’s fourth-leading scorer (Charles Jenkins). There’s a lot to get to in the check-in/postseason preview, so follow along as we recap the regular season that was and look ahead to the postseason that will be.